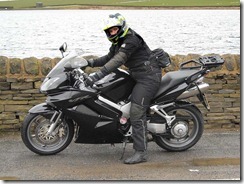 Cavturbo's Motorcycle Blog: Helen’s new bike and Maintenance. Helen’s new bike arrived yesterday a Black 2008 Honda VFR800 VTEC. She decided to get a VFR after really enjoying riding my bike last year on 2 runs when her BMW was out of action. She found it easier to control and liked not having to dance up and down the gearbox like you needed to on her old BMW. We managed to get out on the bikes today for a brief run up and over Saddleworth Moor. We stopped up at Ringstone Edge Reservoir for a brief break and while talking to another brave biker, it started to snow so we headed back home in case it starting coming down properly. There were huge banks of snow on the road up from Denshaw towards the M62 junction at Rishworth Moor. We also found snow in the middle of the road on Saddleworth Moor, unfortunately there was nowhere good to stop to take a photo. 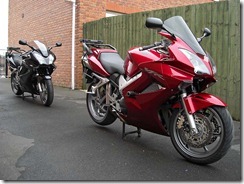 After we got back I did some more maintenance on the ZX-9R. I oiled all the cables internally with a cable oiler and the throttle is now snapping closed with much more gusto. I also greased up all the pivot points and sidestand parts as well. I also installed a 12v inline socket for use with my sat nav and other electrical gear. I have installed it out of the way, but it can be quickly re-routed up and into my new Bagster Minea tankbag when required.